This light bodied wine was picked up on clearance at a price much less than the $15 retail. It is an interesting and enjoyable bottle. The men involved in Sauvignon Republic (John Buechsenstein, John Ash, Paul Dolan and Tom Meyer) are entranced by Sauvignon Blanc and are committed to becoming experts on this grape variety. They are passionate about it and are producing Sauvignon Blanc in the three of the finest locations in the world: Marlborough in New Zealand, Stellenbosch in South Africa, and the Russian River Valley in California. 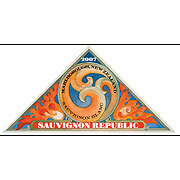 The Marlborough Sauvignon Blanc is a brilliant gold in the glass and has the zestiness typical of the New Zealand Sauv Blancs. It's a great choice for those who don't like "sour" wines. It is clean and crisp with a hint of minerality. As spring starts to blossom, this is a "go to" wine as it is a great warm-weather wine. Sauvignon Blanc pairs exceptionally well with seafood and is a winner with poultry too.